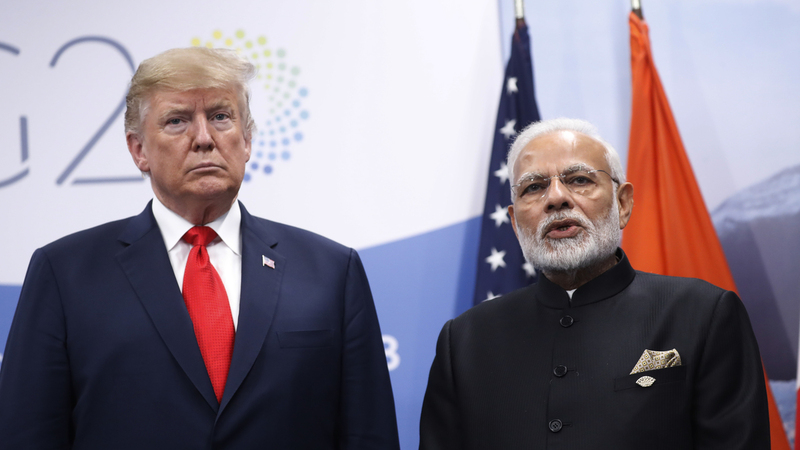 Trump To End India's Preferential Trade Status The president announced he is removing preferential trade status for India because he says that country does not provide the U.S. with reasonable access to its own markets. President Trump meets with Indian Prime Minister Narendra Modi in Buenos Aires, Argentina, in November. On Monday, Trump announced he would be ending preferential trade treatment for India. In a letter sent to Congress on Monday, Trump wrote he is taking the step because "I have determined that India has not assured the United States that it will provide equitable and reasonable access to the markets of India." The Office of the U.S. Trade Representative says the change will be enacted by presidential proclamation but not for60 days. Monideepa M. Mukherjee, a spokeswoman for India's commerce ministry, indicated that India has accepted the move, The Associated Press reports. "The GSP benefits will go; the U.S. will not relent on this," Mukherjee said. India is the largest beneficiary of the program, with GPS imports including thousands of products and totaling $5.7 billion in 2017, a USTR spokesperson told NPR in an email. Implemented in the 1970s, the program was designed to give developing countries a leg up toward expanding their economies. Today, India boasts one of the world's fastest-growing economies, with top exports to the U.S. including precious metals and diamonds, mineral fuels and aircraft. Mukherjee said India has outgrown its GSP status, although she did dispute Trump's assertion that India is not providing the U.S. with reasonable market access, reports the AP. The U.S. is India's top export destination, while India ranks 15th for the U.S.
Mukherjee said the GSP benefits for India amounted to only $190 million a year. Total U.S. goods and services trade with India totals around $126 billion, according to federal data. "GSP withdrawal will not have a significant impact on India," said Indian commerce secretary Anup Wadhawan. In a lengthy speech at the Conservative Political Action Conference in Maryland on Saturday, Trump picked up on an oft-bemoaned grievance: the U.S. trade imbalance, calling out India in particular. "India is a very high-tariff nation. They charge us a lot. When we send a motorcycle to India, it's 100 percent tariff. They charge 100 percent. When India sends a motorcycle to us, we brilliantly charge them nothing," Trump said. The U.S. says its goods and services trade deficit with India is more than $27 billion. Contributing to the imbalance are India's import licensing requirements (including for motorcycles), export subsidy programs and lack of transparency in its laws regulating trade, says the Commerce Department's International Trade Administration. Also Monday, Trump said he intends to end Turkey's status as a GSP beneficiary, based on that country's economic growth. Trade Minister Ruhsar Pekcan tweeted that Turkey will press ahead with efforts to increase trade, calling the U.S. a "strategic partner."